After my Ispahan loaf disaster I am on high alert for potential baking problems. Reading through Dorie's recipe for Financier cake red flags went up for me when she started to describe heating while stirring egg whites and batter over low heat. I had never heard of doing such a thing. I checked out other Financier recipes and they made no mention of heating the batter. So I decided to play it as safe as I could, while still going rogue. I veered off of the road but still kept my seat beat on... so to speak, by using the same ingredients that are in Dorie's recipe with a simple baking technique that I have seen many times in Cook's Illustrated cookbooks. America's Test Kitchen recipes if you are not familiar with them are pretty foolproof, even I can bake one of their cakes. Again with the intention of making this recipe as simple, easy and inexpensive (I am not buying small pans that I will not use again.) for the average home baker I made one cake, and just cut it into small pieces. You would be surprised the cut cake did not produce a lot of crumbs, which I found charming about why the cake was created: as "a fast food pastry that hurried brokers could eat without knife, fork, or fear of telltale crumbs." The result was fantastic. The cake reminds me of a Madeleines in both flavor and texture. It is light, yet has a nice crust. The only thing I would do differently the next time I make this cake is to add a little almond extract because I was hoping for more of an almond flavor. I served the cake topped with honey and strawberries. Any fruit would be fine, but don't skip on the honey. Honey and almond are manna from heaven! adapted from Dorie Greenspan's Financiers recipe in Around My French Table. 1) Preheat the oven to 425 degrees. Put rack in middle. 2) Spray a 9x9x2 1/2 inch pan with nonstick cooking spray. Line the inside of the pan with a sheet of parchment paper. 3) In a standing mixer using the whisk cream the butter with the sugar on medium. Once it is well mixed add the egg whites and almond extract. 4) Whisk the egg white mixture until the eggs are firm but not stiff. 5) In a separate bowl mix the all purpose flour with the almond flour. 6) Change the whisk attachment to the paddle attachment and slowly add the flour mixture to the egg mixture. Stop mixture as soon as the flour is incorporated. It is important not to over mix the eggs and loss their airiness. 7) Pour batter, scrapping sides with a spatula into the baking pan. Bake for 15-20 minutes or until the cake is golden brown, firm to the touch, and a toothpick comes out clean in the center. 8) Let cake cool for 5 minutes before removing it from the pan and letting it cool on a cooling rack. Let cool for at least 10 minutes before serving. I always have egg-whites in my freezer (as I use only yolks in my challahs), so I should try this cake soon! Absolutely, it really has a lovely texture, not too sweet either. 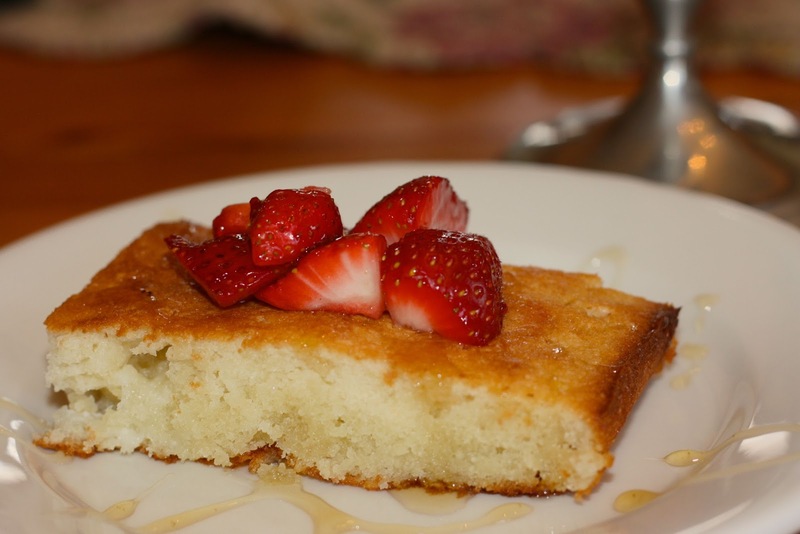 These look and sound delicious, especially with the honey and strawberry topping! Really perfect for this time of year because the cake is light and you get to use strawberries which are just coming into season. This really is delicious, isn't it Diane. You actually did make "little loaves". Bet your kids loved this with honey and berries. What I could find in my packing boxes were a mini-muffin pan and a madeleine tin (which I have never used and was amazed to find - think I picked it up at a thrift shop). Anyway, those were my molds. At this point in my Life, I do have to agree that you don't buy equipment to use once. You learned that sooner than I did, I'm afraid. Somehow I don't think of you as a "going rogue" gal. Well, I'm definitely a minimalist... I love to get rid of stuff more than I like to accumulate it. Love to be light and as far as going rogue... I have written my own versions of quiet a few of Dorie's recipes. Yes, I have taken much slack in life for following my own direction... but in the long run it sure feels good to have personal integrity. Your cake version came out gorgeous…and the presentation is lovely! I unfortunately love to collect baking things…I really have a problem!! Nice interpretation!! Thanks Kathy... my husband asked me to bake this again. No one in my family usually ever asks me to bake anything a second time so I think this turned out well. I loved this little things, and I think that in cake form they are even easier! Nice idea Diane. I was concerned about the stove mixing of ingredients, but it turned out much simpler than I thought. Have a good weekend! I will try browning the butter... but I still don't see the value of heating the batter. My cake's texture looks the same as everyone elses. I was worried as I heated the batter. Glad yours turned out. We have recently moved to a smaller kitchen and I refuse to add new pans. I already had some small tart pans. I guess I could have used a muffin tin... but it was easy putting it into a large pan. The smaller ones might be nice for company. Thanks Patty... I just am not experienced enough baking to try advanced techniques... I turn into Lucille Ball. Whether it's one cake cut into pieces or a group of mini cakes - as long as it gets eaten and enjoyed, that is how I measure success! Yes, when you are a non baker like me... you have to figure out ways to keep from eating raw batter or burnt cake. Gorgeous! I also love the America's Test Kitchen techniques which never fail but Dorie has not really let me down either so followed her exactly. Amazing flavor even without the extract! You are one of the lucky ones... that Ispahan loaf was a disaster for a lot of us. Though I have figured out that our ovens are about 25 degrees different. Thanks for stopping by... haven't seen you in a while. What a splendid & beautiful version of the financiers- a cake! Thanks Bev... glad you stopped by. I like the simplicity of baking it in one pan. You asked about my skin-on almond meal. My financiers didn't taste overly almondy. I think adding the extract, as you did, is the way to go for that. I'm making a note to do that next time. Have a great weekend. I see it is more of just a texture thing. I might try that... a rustic texture if I decide to brown the butter might be nice. You are welcome... like to support another almond fan. If you look at some of the other versions of this cake it is cut to make them in small pans and to put fruit in them too. But I did love this simple version with honey on top. Just love honey and almond together. Great idea to just cut them into bars, Diane. Your financier looks beautiful. I also like your idea of adding some almond extract and honey to the batter. Thank you Elaine.. l just love the taste of almond and honey together. This is not as indulgent as some of your wonderful creations but for the Spring and Summer it is light and delicious. Yum, almonds always make me feel happy, I love them. Oh it is. I hope you try it. Sounds very good! I love almond cake, but never have made it myself. It is really wonderful, light... I hope you try it. You might say you're not a baker, but it's very brave of you to combine Dorie's ingredients with a different technique. And it worked! I'm very impressed. I'm normally too scared to divert from recipes at all, and especially when it comes to baking. Yeah, but I used cook's illustrated... truly Jora, if you ever have to bake, use their techniques. it always works. This sounds absolutely incredible. I like your version of Dorie's recipe! Thanks... I think it is simpler and I still don't really get why you would heat batter? I have never purchased almond flour loe to try this. thanks for linking up to friday food frenzy!! It really has a nice flavor and it is a bit healthy. Some people made this cake with almond meal if you want a more rustic texture. Thank you so much for linking up to The Busy Bee's (Thursday link party) This recipe looks absolutely wonderful! We are so happy to have you with us! I've only just made these this week. I like your cake version - it must have been lovely topped with honey and fruit.